Garbiel caught four passes for 37 yards while adding a pair of rushing attempts for 20 yards in the Bears' 16-15 playoff loss to the Eagles. Analysis: Gabriel was targeted nine times and used mostly on short-to-intermediate passes to help move the chains in the Bears' playoff loss. Gabriel ended the season -- his first with the Bears -- with 67 catches for 688 yards and two scores, but he didn't find the end zone after Week 4 and only had two strong fantasy performances all year. He'll enter the second of a four-year contract as a low-upside fantasy option who has yet to post 700 receiving yards in any of his five NFL seasons. Gabriel (ribs) was a full practice participant Wednesday, Rich Campbell of the Chicago Tribune reports. Analysis: This confirms Gabriel escaped with a minor injury during Sunday's 24-10 win over Minnesota. With Allen Robinson (ribs) and Anthony Miller (shoulder) also managing full participation at practice, Mitchell Trubisky heads into the playoffs with his full complement of weapons. The first test comes this weekend in a wild-card matchup with a shaky Philadelphia pass defense. Gabriel injured his ribs during Sunday's 24-10 win in Minnesota, Patrick Finley of the Chicago Sun-Times reports. Analysis: Gabriel's injury initially was termed a shoulder concern, but further evaluation helped the Bears hone in on the area at issue. Coach Matt Nagy said Gabriel and Anthony Miller (shoulder) will continue to be examined but believes neither injury is serious. The duo joins Allen Robinson (ribs) as banged-up Bears receivers heading into preparation for a wild-card matchup with the Eagles. Gabriel was forced from Sunday's game against the Vikings after suffering a shoulder injury. Analysis: Anthony Miller was also ruled out with a shoulder issue with Allen Robinson (ribs) already inactive, leaving the Bears with little depth at wide receiver. Josh Bellamy, Kevin White and Javon Wims are the remaining wideouts on the roster for Chicago. Gabriel may have more play-making opportunities available Sunday against the Vikings with Allen Robinson (ribs) inactive for the contest, Larry Mayer of the Bears' official site reports. 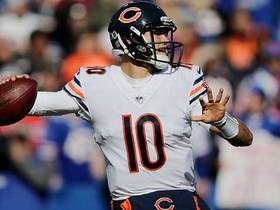 Analysis: Quarterback Mitchell Trubisky has typically spread the wealth around among the Bears' pass catchers this season, but Mayer posits that Robinson's absence coupled with the artificial turf in Minnesota will prove most beneficial to Gabriel, the speediest member of the team's wideout corps. Gabriel didn't need the aid of turf to make things difficult for Minnesota back in Week 11 at Soldier Field, where he turned nine targets into seven receptions for 52 yards and took two carries for 17 yards. 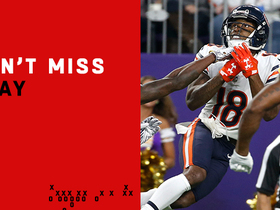 Gabriel caught three passes for 28 yards while adding one rushing attempt for eight yards in the Bears' 14-9 victory over the 49ers. 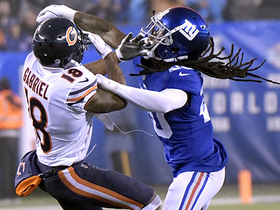 Analysis: Amazingly, Gabriel's three targets and 28 yards were third on the team, but that had to do with an ultra-conservative game plan the Bears used to control the clock. Over the last four games, he hasn't posted 35 receiving yards, and he'll be tough to use in fantasy lineups in Week 17 against a tough Minnesota defense. Gabriel caught three passes for 33 yards in Chicago's 24-17 win over the Packers. Analysis: After being targeted at least seven times in each of his last four games, Gabriel was targeted just three times as the Chicago offense leaned upon its rushing attack to control the clock. He hasn't scored a touchdown or exceeded 52 yards in any of his last nine games, making him a low-upside option in the fantasy playoffs. Gabriel caught three passes for 22 yards in the Bears' Week 14 victory over the Rams. 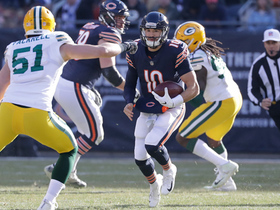 Analysis: Gabriel saw an impressive seven targets, but Mitch Trubisky was erratic as a passer in his return from a shoulder injury. With fewer than 25 yards in each of his last three games with Trubisky under center, along with the fact he hasn't scored a touchdown or surpassed 52 yards in any of his last eight games, he'll be tough to trust in the fantasy playoffs. Gabriel caught three passes for 17 yards in Chicago's Week 13 loss to the Giants. Analysis: After notching a pair of 100-yard performances earlier in the season, Gabriel hasn't exceeded 52 receiving yards or scored a touchdown in any of his last seven contests. However, he's been targeted at least seven times in each of the last three games, and he's always a threat to make a big play, so his volume and and potential make him a borderline fantasy starter. Gabriel brought in seven of eight targets for 49 yards in the Bears' 23-16 win over the Lions on Thursday. Analysis: Gabriel's reception total drew even with that of Tarik Cohen's for the team lead on the afternoon. The sixth-year wideout now has back-to-back seven-catch efforts, and he's logged an elevated 17 targets overall in the last pair of contests. However, Gabriel hasn't found the end zone since Week 4, a matter he'll try to rectify versus the vulnerable Giants defense in a Week 13 matchup on Dec. 2. Gabriel caught seven balls (on nine targets) for 52 yards in Sunday's 25-20 win over Minnesota. He also ran the ball twice for 17 yards. Analysis: Gabriel led the Bears in targets, catches and receiving yards a week after not recording a reception. The nine targets were the second-highest total for the 27-year-old. This was likely a result of No. 1 wideout Allen Robinson drawing the much tougher matchup against shutdown corner Xavier Rhodes. A similar target share could unfold Thursday against the Lions if Robinson is forced to match up against Darius Slay. Gabriel was targeted three times but failed to catch a pass in Chicago's Week 10 victory over the Lions. Analysis: Gabriel was targeted on a deep pass in the end zone, but the ball was overthrown, but otherwise he wasn't a focal point of the Bears' attack in an easy victory over the Lions. After posting a pair of 100-yard games, he's averaged just 31 yards in the four games since, making him a risky option in weekly fantasy lineups. Gabriel (knee) was a full practice participant Thursday, Kevin Fishbain of The Athletic reports. Analysis: Gabriel is on a similar path to last week, when he followed up a limited session Wednesday with an uncapped practice one day later. Such progress is welcome after he limped off the field near the conclusion of this past Sunday's win at Buffalo. With Allen Robinson (groin) set to return Week 10 versus the Lions, Gabriel will revert to a secondary option in the Bears' passing attack. Gabriel (knee) was limited in practice Wednesday. Analysis: Gabriel began last week with the same listing, only to practice in full twice to wrap up Week 9 prep. Near the end of Sunday's convincing victory in Buffalo, he limped off the field favoring his right leg, which coach Matt Nagy termed "soreness" afterward, per Adam Hoge of WGN Radio 720 AM Chicago. There's a chance Gabriel's right knee injury lingers, but the fact he fit in some activity indicates the Bears have instituted a maintenance program of sorts with his availability on gameday in mind. After Sunday's 41-9 win in Buffalo, coach Matt Nagy called Gabriel's right leg injury "soreness," Adam Hoge of WGN Radio 720 AM Chicago reports. Analysis: Despite limping off the field in the fourth quarter, Gabriel appears to have escaped Week 9 with a minor health issue. He finished the day with three catches (on five targets) for 45 yards, the latter of which he's achieved (at least) in four of the last five contests. Wednesday's injury report will reveal whether Gabriel's practice reps are impacted. 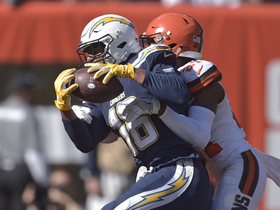 Gabriel limped off the field favoring his right left in the fourth quarter of Sunday's 41-9 win at Buffalo, Rich Campbell of the Chicago Tribune reports. Analysis: Prior to his departure with 4:40 left in the game, Gabriel gathered in three of five passes for 45 yards. He's reached that yardage total in four of the past five games, a trend that could continue if his injury isn't serious and No. 1 wide receiver Allen Robinson continues to miss time with a groin concern. The Bears won't practice again until Wednesday, so coach Matt Nagy may not touch on Gabriel's health until midweek. Gabriel (knee) was a full participant in Thursday's practice, Rich Campbell of the Chicago Tribune reports. Analysis: Gabriel's advancement to full participation after being limited in the Bears' first session of the week suggests his knee issue isn't too worrisome. Though he posted a modest line of four receptions for 52 yards in Sunday's 24-10 win over the Jets, Gabriel could handle an elevated role on offense in Week 9 against the Bills with top wideout Allen Robinson (groin) in danger of a second straight absence. 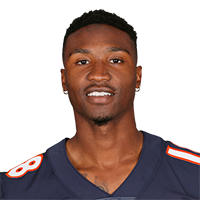 Robinson was a spectator in the Bears' practices Wednesday and Thursday. Chicago Bears quarterback Mitchell Trubisky launches a 40-yard pass and wide receiver Taylor Gabriel flies into the air to make a diving catch. Chicago Bears quarterback Mitchell Trubisky finds wide receiver Taylor Gabriel for 14 yards. Los Angeles Rams cornerback Nickell Robey-Coleman perfectly reads Chicago Bears quarterback Mitchell Trubisky for an interception. 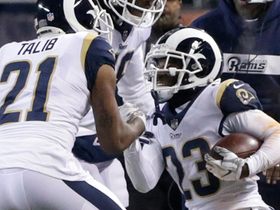 NFL Network's Marc Istook and Adam Rank highlight four fantasy steamers to play in Week 14. Chicago Bears wide receiver Taylor Gabriel fumbles while trying to turn up field and the New York Giants recover. 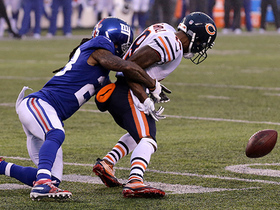 New York Giants cornerback Janoris Jenkins plays lock-down defense to shut down the Chicago Bears comeback. 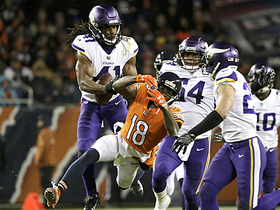 Minnesota Vikings safety Anthony Harris makes leaping interception over Chicago Bears wide receiver Taylor Gabriel. Chicago Bears quarterback Mitchell Trubisky finds wide receiver Taylor Gabriel for a 22-yard gain against the Buffalo Bills in Week 9. 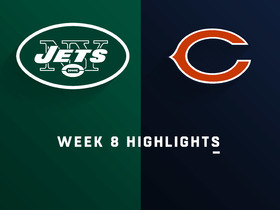 Check out the highlights from the New York Jets Week 8 matchup against the Chicago Bears. 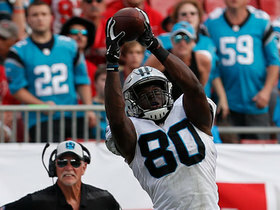 Here is a look at the best catches from Week 6 around the NFL.